When Apple introduced this addition to the Health app a year ago, there were just a dozen hospitals and clinics participating. Today there are over 160 entries on Apple’s list of “Institutions that support health records on iPhone” from across the US. Among the organizations supporting this heath records system is University of California San Diego Health who asked 425 users a three question survey. There were 132 responders, mostly upbeat about the program. “Respondents indicated that they could easily connect their mobile devices to the platform (96%), that they were satisfied with using the feature (78%), and that the smartphone solution improved their understanding of their own health, facilitated conversations with their clinicians, or improved sharing of personal health information with friends and family (90%),” wrote Doctors Christian Dameff, Brian Clay and Christopher A. Longhurst in an article for the Journal of American Association (JAMA). For those using this system, data available through the iOS Health app includes immunizations, lab results, allergies, medications and vitals. Previously, patients were required to collect their medical data from the websites of multiple sources. 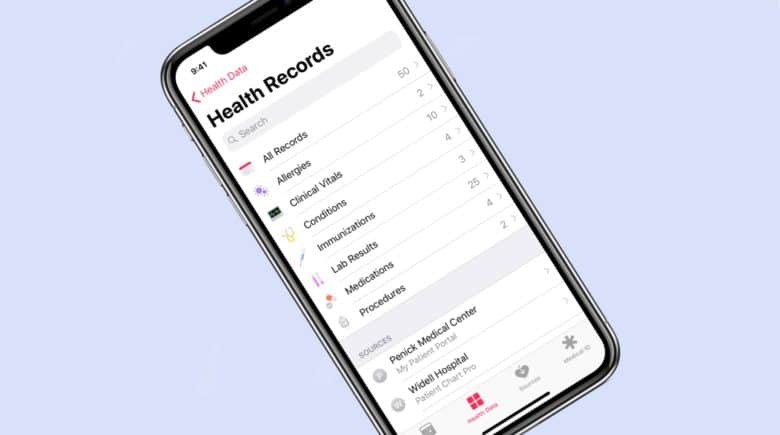 Apple’s app uses FHIR (Fast Healthcare Interoperability Resources), a standard for transferring electronic medical records. The information is transferred directly from the hospital or doctor to the iPhone and doesn’t go through Apple servers. Apple began a push into health tracking after the death of Steve Jobs, co-founder and former CEO. He was diagnosed with pancreatic cancer in 2003 and passed away in 2011. Apple added the Health app to iOS 8 in 2014. Jobs’ experiences inspired 2015’s Apple Watch and its health-tracking abilities. The latest version of this wearable is the first with an ECG that helps diagnose heart problems.